Please examine your food processor blade to see if it is riveted. Your food processor is one of the items designated for the voluntary recall. Please STOP using the riveted blade immediately. If you are inputting a Canadian zipcode, please use this link to fill out your recall request: Canadian Recall Form, otherwise please enter your U.S. 5 digit zipcode. Your Food Processor is NOT involved in this recall. You may continue to use it. Thank you. Thank you for submitting the recall and on behalf of Cuisinart please accept our apology for any inconvenience this may have caused you. 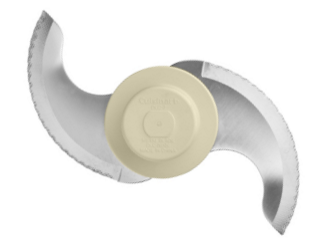 Now that we have your contact information, Cuisinart will send you a free replacement blade. 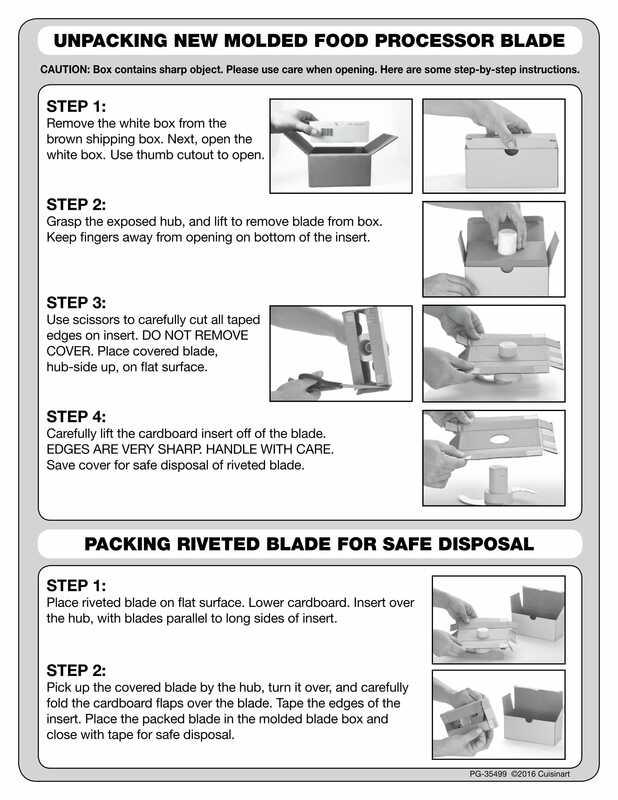 When you receive your replacement blade, use the packing materials that your replacement blade arrived in to safely dispose of your original blade. Please note that the other portions of the food processor, including the bowl, housing base and motor are not subject to this recall. Your Service Notification number is ''. Please hold onto this number for future reference. 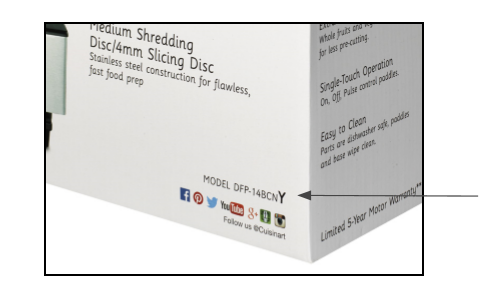 The riveted blade may crack and a piece of the blade could detach, which may result in a laceration hazard. If your blade has rivets, check the Model or Series number of your Food Processor, as shown on the bottom of the Food Processor (see below). If the number starts with any of the above (which may be followed by a suffix), STOP using the riveted blade immediately. Call the Customer Service number or register Online to receive a replacement blade (see below). Your Food Processor is NOT involved in this recall. You may continue to use your Food Processor. Monday - Friday: 7:00AM to 11:00PM E.T. Saturday - Sunday: 9:00AM to 5:30PM E.T. Conair Corporation has notified the US Consumer Product Safety Commission of this voluntary recall. 1. This voluntary recall does not affect food processor units or any other parts or accessories – only the riveted blades are being recalled. All food processor units and other parts and accessories may continue to be used. 4. The number of reported incidents related to the riveted blade is very small when taking into account the total number of riveted blades sold and the many years of distribution. Conair and Cuisinart take the safety of their customers very seriously, which is why they brought this to the attention of the CPSC and commenced a voluntary recall. 5. 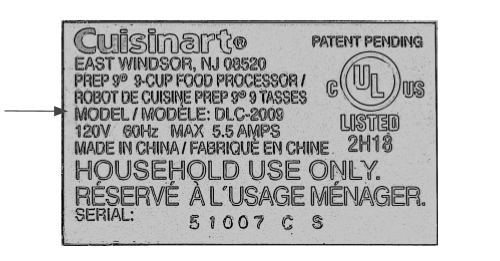 Consumers should visit www.cuisinart.com/recall to determine if they have a food processor that is affected by this recall, and to register for a free replacement blade. Cuisinart, universally known for introducing the food processor in America, is a leader in culinary appliances, professional quality cookware and kitchen accessories. The company’s cutting edge reputation can be seen on numerous fronts, from industry-first products and design awards to sponsorships of culinary events and TV cooking shows. Cuisinart manufactures a full range of products under the tagline, “Savor the Good Life®.” These products include cookware, countertop cooking appliances, blenders, stand mixers and coffeemakers, as well as food processors, toasters and toaster ovens, ice cream makers, and waffle makers. Cuisinart has the following websites: www.cuisinart.com and www.cuisinart.com/baby, and social media sites: www.facebook.com/cuisinart, www.twitter.com/mycuisinart, www.twitter.com/cuisinartpr, www.instagram.com/cuisinart and www.snapchat.com/cuisinart. The company also has an iPhone, iPad and Android app, Cuisinart’s KitchenSync http://www.cuisinart.com/recipes/kitchensync.html. 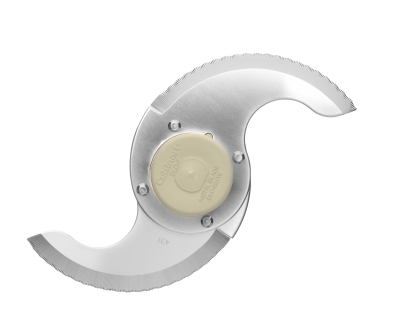 On December 8, 2016, Conair Corporation (Cuisinart), in cooperation with the U.S. Consumer Product Safety Commission, announced a voluntary recall of riveted cutting blades in certain Model and Series Numbers of Cuisinart® Food Processors listed below. 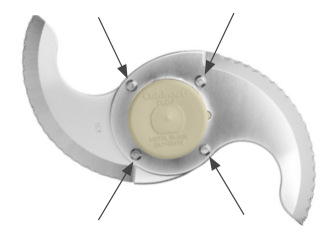 Cuisinart is instituting this voluntary recall because it has received several consumer reports of cracks found in riveted blades from use of the food processor over time, which could on rare occasion cause a portion of the blade to detach. The recall applies only to riveted blades of food processors that are in the Model or Series Numbers listed below. The number will start with a Series Number, which may be followed by a suffix, and is located on the lower, right corner of the front panel of the packaging of the food processor and on the bottom of the food processor unit. Cuisinart is contacting you as our records indicate that you purchased one of the models listed above and you registered with Cuisinart on the Cuisinart website. 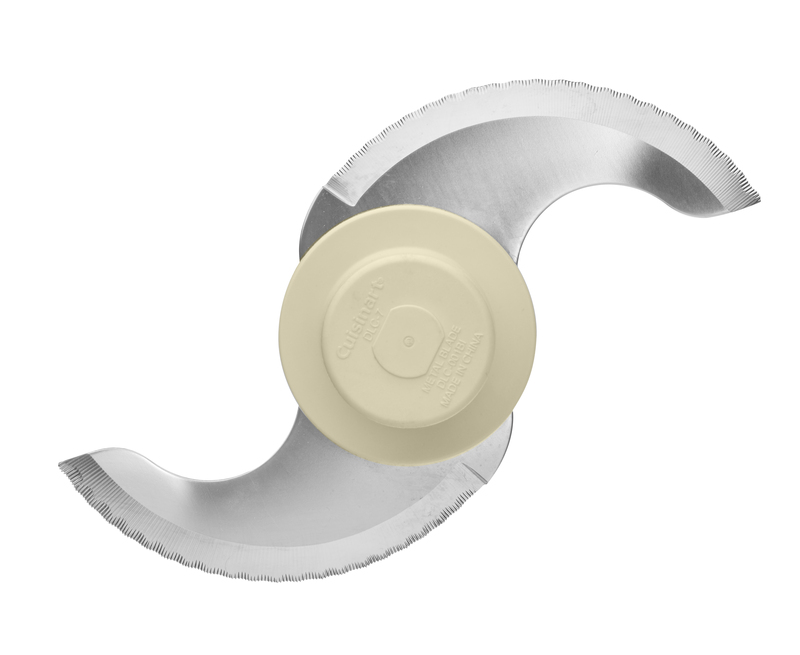 If you have a Food Processor that is one of the Models listed above, and it contains a riveted blade, please stop using the blade immediately and contact Cuisinart for a free replacement blade. For more information consumers should contact Cuisinart at (877) 339-2534 between 7:00 a.m. and 11:00 p.m. ET Monday through Friday, and 9:00 a.m. and 5:30 p.m. ET Saturday or Sunday, or go online to www.cuisinart.com/recall. We apologize for any inconvenience and appreciate your cooperation during this recall. Cuisinart is proud to consistently produce high quality appliances and we assure you that we will continue to strive to meet your expectations and high standards for quality products. ©​ 2019 Cuisinart. All Rights Reserved​.